Cast: Han Geng, Tiffany Tang, Jacky Wu Jing and Karen Mok. This is the third movie in the franchise, and a different twist to the original ending of part two. After getting a hold of Pandoras Box, Zi Xia (Tiffany Tang) uses it to see into the future, of how she and Joker (Han Geng) are going to be in the future, only to witness her own death. When returning, she tries to read Jokers heart, and finds out that if he falls in love with her, she is bound to die, but might have a different fate if he returns to Bak Jing Jing (Karen Mok). This leads her to look for Jing Jing, who not only doesn’t believe Zi Xia, but refuses to accept Joker as the Monkey King. To tell the truth, Han Geng was the reason I opted to watch this trilogy. 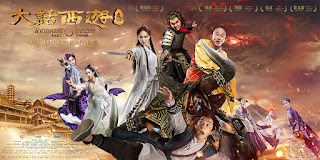 I had seen that the third instalment had Han Geng as the lead, which is why I watched the entire thing. Though I have to say Han Geng was amazing, in portrayal of the monkey king, and the imitation of Stephen Chow, which by the way was flawless. The cameos were great too, and I gotta admit, I enjoyed this movie, though I was hoping for something different. It wasn’t necessarily boring, but I wasn’t totally into it, as the storyline was a bit… the same? I mean, I get it’s the third instalment, and we are doing the entire “retelling of the second movie”, but I honestly felt, I could’ve done without this movie. So, all in all, an enjoyable movie, but noting out of the ordinary.